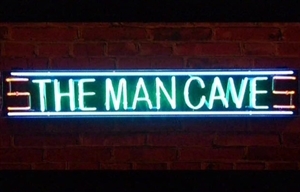 The Man Cave is a South African reality television series produced by Cheeky Media which follows a variety of presenters as they tackle all matters male, competing against each other in adrenaline-filled tasks, test driving cars, reviewing gadgets, giving DIY tips and more, all with the aim of providing men with their own haven - a virtual man cave. The series delivers a weekly dose of testosterone-driven content to men seeking a hefty helping of adventure. On the flipside, it gives women the opportunity to try and understand what makes men tick. With an emphasis on honest opinion and casual conversation, along with action-packed sequences set in jaw-dropping destinations, each episode comprises four inserts spanning the full spectrum of male fascination and interest. From inspirational stories on local celebrities and rendezvous with gorgeous girls, to adrenaline sports, hi-tech gadgets, dude food, fashion trends, fitness tips and first-hand reviews of cars both ultramodern and classic – The Man Cave gives South African men plenty to beat their chests about. Throughout the series Janez and Lunga – bad boys with equally competitive spirits and polar opposite views on what it means to be a real man – lock horns to compete for victory in an array of heart-stopping, bucket-list challenges designed to put their strengths and egos to the test. Expect everything from gruelling fitness face-offs and relentless survival showdowns, to culinary mash ups and fuel-injected thrills as the men push high-performance cars to their limits on the track – after which only one will walk away with bragging rights to the ultimate prize: man pride. The men go to the ends of the Earth to entertain the show's female guests, like Miss SA Rolene Strauss whom they invited to Switzerland for an extreme alpine adventure in celebration of Women's Month. Of course, a series of this nature and title would be incomplete without a man cave of its own. As such, it is broadcast from Janez and Lunga's exclusive man cave which takes shape as the series progresses, enabling viewers to pick up some nifty DIY tips along the way. A production by Cheeky Media, the series is executive produced by Yusuf Stevens and Janez Vermeiren. Episodes in the first four seasons were half an hour long. For Season 5 episodes were extended to an hour in length, as part of the channel's mandate to broadcast 80% local content. It was reduced back to 30 minutes for Season 6, when the local content quota was discarded. Come Dine with Me SA 4 comes to BBC Lifestyle, The Man Cave resumes on SABC3 and BBC Earth has the truth about getting fit. A wrap of the guests on SABC3's late night talker over the next two weeks.